This beautiful knee high platform boot has a 4 inch heel. The front of the boot has five buckle straps. 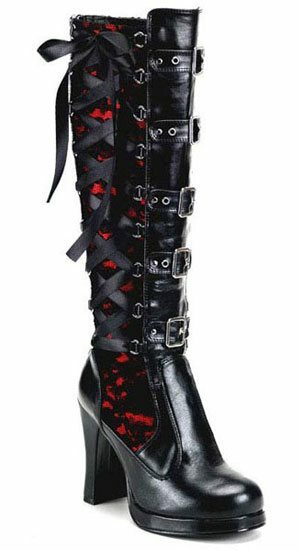 The sides are laced up with corset satin ribbon laces on top of red accented by lace which make a truly unique and stunning pair of boots. These were a surprise gift for my daughter. She was so excited when she saw them. PERFECT! ! I love the look of them. The I had two issues. The zipper running along the backside was difficult to move. The other issue was that they are tight against my legs. I would also like to point out that I'm not 'model skinny' but I'm about average. If you think you are skinny, you shouldn't have an issue. But if you're over weight, I recommend not buying these.